The Woody Guthrie Center occupies part of the larger historic renovation project of the Mathews Warehouse (also known as the Tulsa Paper Company) building spearheaded by the George Kaiser Family Foundation. Historic preservation tax credit guidelines were used, revitalizing an iconic building. We worked closely with exhibit designers Gallagher and Associates to ensure the building functions properly for interactive exhibits and creates a cohesive experience for museum-goers. 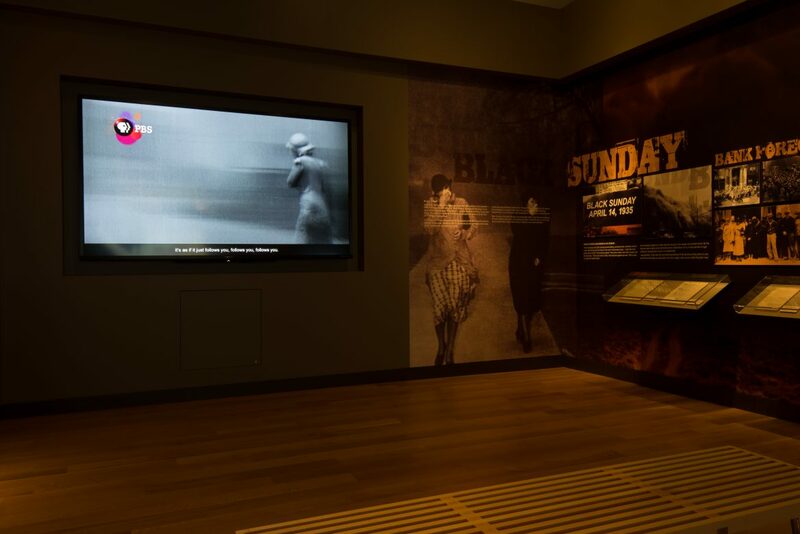 Integrated technology forms the backbone for the virtual reality Dust Bowl exhibit and the museum’s many audio-visual immersive experiences. Specialized climate-controlled, visible storage areas preserve and display documents, musical instruments, and recordings. This archive and museum of singer-songwriter Woody Guthrie’s lifetime of creative expression invites visitors to listen to Guthrie’s voice and consider the history around the social justice issues which informed his work, culminating in an invitation for a creative response from the visitor. The museum has three spaces that double as upscale event venues: the gallery, a classroom, and the theater accommodate groups of 24-200. An iconic outdoor mural, echoing the painted-brick signage of the past, gives this project a distinct identity.